Ave Maria Press (Notre Dame, Indiana, 2016). by Nina Roesner and Debbie Hitchcock. Nelson Books (Nashville, Tennessee, 2016). 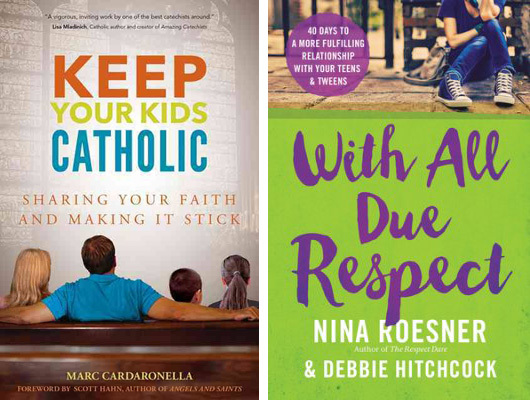 “Keep Your Kids Catholic” is a timely book written by husband and father Marc Cardaronella, who draws from his experience of leaving behind the Catholic Church after eighth grade and on into adulthood, to assist parents with strategies that may foster the lived experience of faith in their children. Making a case against the assembly-line religious education programs that many parents blindly trust as a guarantee that the faith will be passed on, Cardaronella shares his own experience that is quite typical of many adult “revert” Catholics who went through a program without ever experiencing a living relationship with Jesus Christ. One thing that is perfectly clear from this book is that any hope of having children living the faith must be preceded by parents who are fully engaged in living the faith. Faith formation that seeks adult conversion in children begins with an adult conversion for the parents. After an adult conversion to Christ has taken place, the author suggests four ways that parents are essential in handing on the faith — influence, teaching through relationship, talking about faith and religious practices. Cardaronella puts it plainly near the end of his book: “The real job of faith formation is facilitating encounters with God.” The desire of those who have encountered the risen Jesus is to share and accompany others on their faith journey as well united to the body of Jesus, his church. For parents who have an active faith life this book will be a refresher and a reminder to share the faith in the providence of their everyday lives with their children. This book is recommended for parents who have recently encountered Jesus yet didn’t have much, if any, Christian witness in their home. Nina Roesner and Debbie Hitchcock present 40 brief vignettes of parenting situations that anyone with teenagers or “tweens” will surely recognize in their book, “With All Due Respect.” Each of these episodes begins with a foundational verse from Scripture and ends with pointed questions for the reader to ponder and reflect upon, as well as a prayer. The dialogues they craft between parent and child, parent to parent and teenager to teenager are relatable and identify situations that put the parent at a crossroads in making a decision. The authors point out a way to resolve the conflict that they perceive is in line with Scripture and trust that God is working in the midst of these relationships. Teaching moments abound in each of these chapters with the understanding that the ‘Godly’ way is most often the difficult way yet the way that will be rewarded in the end and strengthen the bond between parent and child. The authors are upfront in the beginning that this book is written for moms of “tweens” and teenagers. While they do not underestimate the role of fathers in raising children, they realize that moms are the ones who, as they say, are on the frontlines with their children, typically spending much more time with their children than fathers. One takeaway from the book is a realization that “not every choice our children make (for good or bad) can be traced back to our parenting.” Roesner and Hitchcock are not afraid to tackle potentially explosive issues facing parents and teens and “tweens” in a way that includes God and plants the seeds for dialogue, communication and understanding. Catholic readers should be aware that the Scripture translations are from a number of non-Catholic Bibles and mention of traditional supports for Catholic parents such as a parish priest, religious sister, the parish or a healthy sacramental life is missing. Wright is the academic dean for evangelization in the Diocese of Paterson, New Jersey.